I’ve been working on a new toy and I wanted to give a quick update on my progress with it. Today I’ve been working on a Kidtunes Electronic Keyboard which I picked up at Value Village. 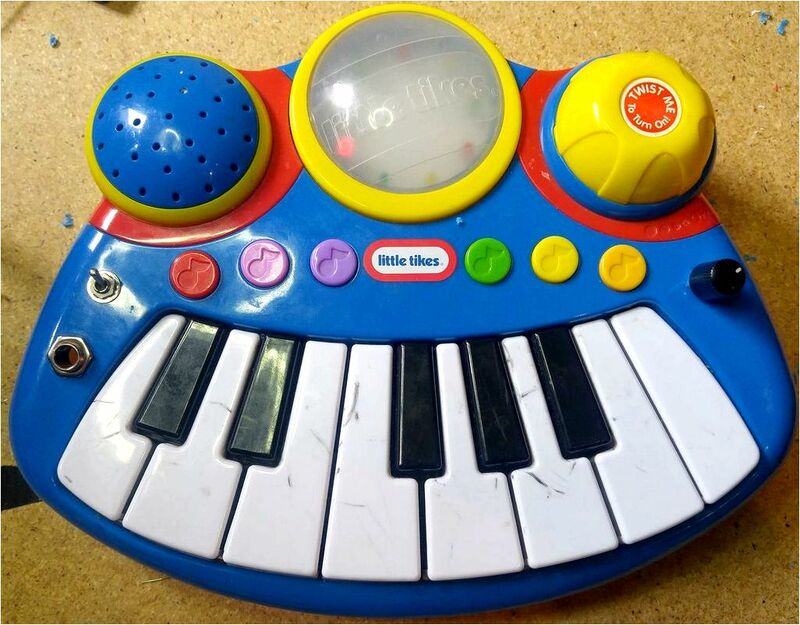 The Kidtunes electric keyboard is made by a Chinese company called Scientific Toys and though I wasn’t able to find an exact year I would assume based on the circuit that it came out in the early 2000s. The keyboard itself is a little odd as it has two octaves (from G to F) but is missing the second F sharp. I guess they assumed kids wouldn’t notice. The toy is monophonic (only one note can be played at a time) but has two distinct voices. There is a sustained organ voice as well as a shorter cleaner piano sound. The Kidtunes keyboard also features a demo mode and a low-high volume control. One thing struck me as odd on the circuit board of this toy. 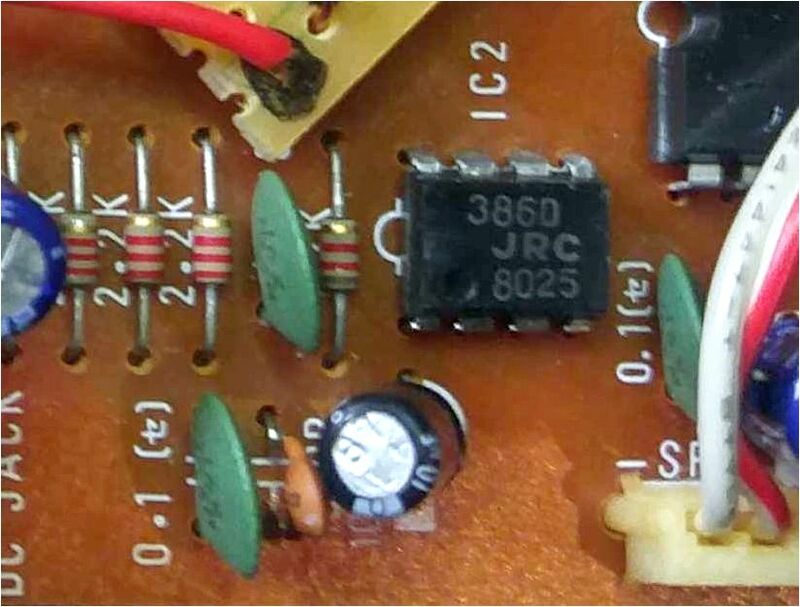 It looks like, though they have used a black blob IC, they manufactured it separately and then added it onto the board. This has left easy access to the pins of the IC where it was connected to the main board. 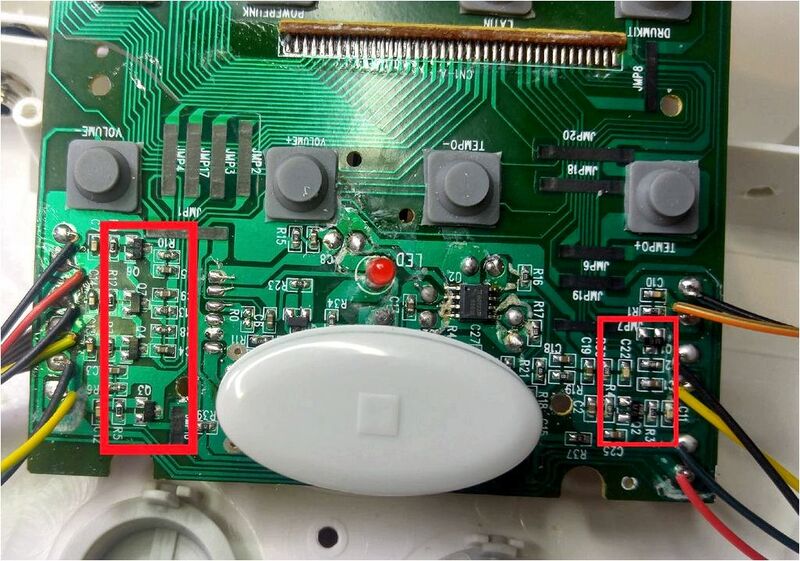 Though the majority of these solder points are triggers for the keys it still allows a level of access which is rare with modern toys. Additionally all of the components outside the main IC are though hole which allows for fairly easy bending and modification. The first thing I added to this keyboard was a simple pitch bend. To do this I located the pitch resistor and removed it. 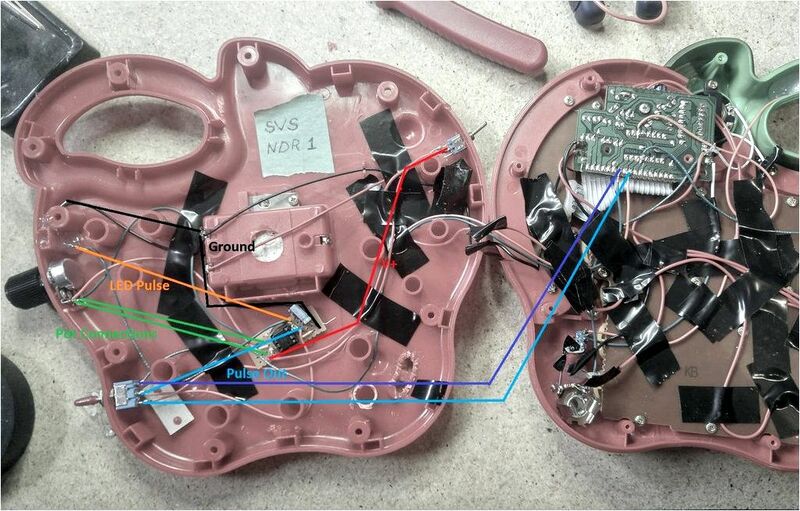 On this toy the pitch resistor was located immediately below the IC. The resistor I removed was 220K ohm so I replaced it with a 100K ohm pot and a 150K ohm resistor in series. While playing with the pitch bend I also noticed I could illicit some very interesting glitches by attaching one of the legs of the pitch resistor through a capacitor to the base of a transistor on the far left of the board. I wired this up through a switch and moved on to see what else was available. The next two bends I found were fairly straight forward point to point connections which I wired through switches. The first (red wires) involved connecting one of the resistors on the board to the trace running across the emitter of the transistor I mentioned in the pitch bend. This bend seems to impact the sustain of the Kidtunes keyboard. By connecting these points all sustain is removed so that the keyboard sounds like an xylophone. The second (yellow wires) connects one of the trigger points to a resistor on the board. When the keyboard is in organ mode this has the effect of holding any note played indefinitely when the switch is turned. Further in demo mode this will cause a note to play repeatedly. This second functionality will be extremely helpful while searching for further bends as I will no longer have to keep pressing keys. That’s as far as I’ve gotten with this one so far. If I am able to find more I will be sure to provide an update. Also I should have a video of this toy online within the next day or so. 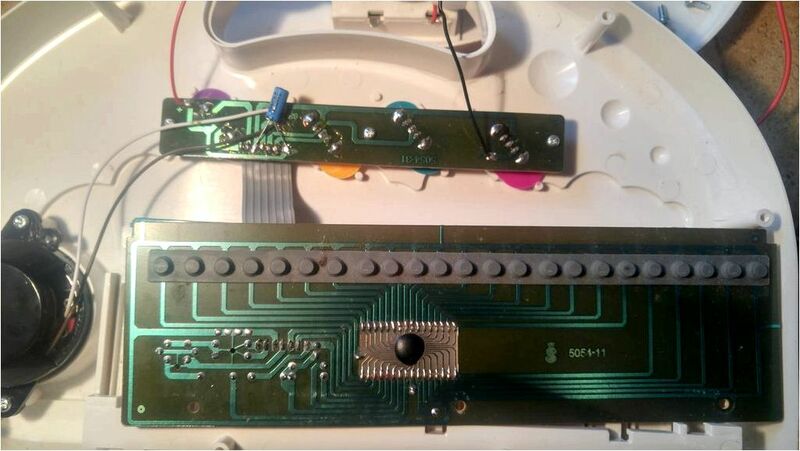 While browsing some circuit bending sites some time ago I found an excellent tutorial over at Circuit-Bent.net for adding a patch bay to a retro Yamaha Keyboard. The tutorial dealt with the PSS-170, 270, 140 and SHS-10 but not having any of these models on hand I wanted to see if I could apply the same technique to the a PSR-6 I recently scooped up on the cheap at a local pawn shop. Finally this past week after the arrival of a big bag of banana plugs from E-bay I decided to give it a try. 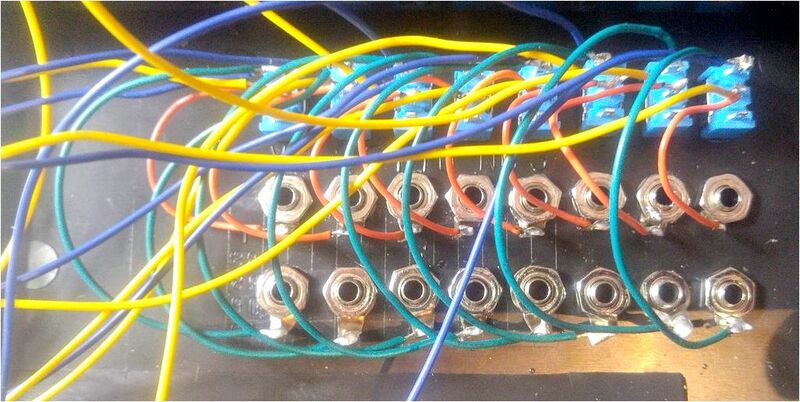 – I also came across a very helpful forum post on Electro Music from another circuit bender (user name Dnny) who converted this mod for a PSR-6, It is definitely worth a read if you are attempting this bend. To understand this bend you have to understand a bit about the inner workings of these keyboards. The PSR-6 (and many others of the era) operates using two primary IC chips. The first of these is the Yamaha XE323B0 CPU chip. This chip is easily identifiable as it will usually be the largest chip on the board and has a huge number of pins (I believe around 60). This CPU chip is the brain of the keyboard. Beside the CPU there is a smaller 18 pin FM synthesizer chip (the YM2413) which is responsible for actually creating the audio signals you hear out of the keyboard. If you study the back (trace) side of the circuit board you will see there are 8 traces which travel directly from the CPU to the FM synthesizer chip. These 8 traces carry instructions from the CPU to the synthesizer chip and tell it when to make noises, and what noises to create. Further each separate pin carries information on a different aspect of the sound. These 8 traces are what I will be hijacking with this bend. 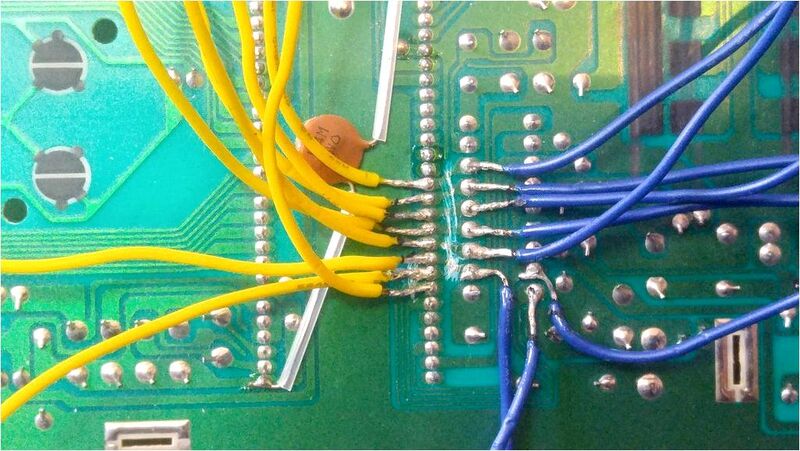 The first step I took was to cut each of the traces running between the CPU and the FM Synthesizer chip of the PSR-6. This will interrupt the normal flow of data. These circuit boards are very ruggedly made (as opposed to some more modern boards) so you may need to cut across them several times with an Exacto knife. Use a multimeter to confirm there is no connection between the two sides once the traces are cut. Next up comes the really fiddly part. I soldered lengths of wires to each pin on the CPU and each pin on the FM synthesizer. I used yellow wire on the CPU and blue for the synthesizer so that they were easily identifiable. It is very important at this point to keep the pairs of corresponding wires together. I used pieces of painters tape to temporarily attach the pairs of yellow and blue wires together and numbered them in order from 1 to 8. Once I had drilled and mounted the components for the patch bay I was ready for wiring. I soldered the blue and yellow wires to the middle and lower lugs of a row of switches. I then ran wire from these switches to two rows of banana jacks. All of the CPU connections I ran to the top row of jacks and all the synthesizer connections to the bottom row of jacks. From here I closed up the keyboard and powered it up. To my delight it worked great. When the switches are all in the up position the data lines are connected and the keyboard works the same as it did without any modification. However when you flip the switches or connect any of the red jacks to any of the black jacks… things get weird. When you are getting started with this patch bay it can be a little intimidating. It will crash and it will spew loud garbled noise, don’t be discouraged. You will also find strange, new and truly bizarre noises you never knew the PSR-6 had in it. A good way to get your feet wet is to choose any instrument on the keyboard. flip down the second switch and then change to a different instrument. The turned switch will stop some of the information regarding the new instrument from reaching the FM synthesizer and you will be left with a strange hybrid of the two voices. The more I play with this keyboard the more fun I have. Slowly I’m beginning to understand what each data line controls and I’ve been able to create more and more interesting patches. One surprising thing I’ve found is not all but many of the patches are repeatable allowing you a level of control over the noise I didn’t expect. This makes the device quite viable for live performance. Now that I’ve gotten my feet wet with this bend I’m incredibly interested in taking it a step further. I’ve seen other circuit benders set up LED’s associated with each data line allowing you to see the data traveling through each connection. This seems like it would be extremely helpful in developing your understanding of what each connection controls. I’m also going to do some tests injecting a square wave oscillation into the data points to see what kind of results this elicits. Finally I’d also be interested to try running the data through an inverter or other logic gates. If I have success with these tests I will create a second post detailing what I’ve found. While completing my first set of mods on my Yamaha PSS-30 I noticed that the internal amplifier driving the mini keyboard was a 386D amplifier chip. This chip has an identical pin out and seemingly identical function to the popular LM386 which gave me some ideas for possible bends I could try. If I was able to apply some common modifications or adjustments which work with the LM386 in amplifier applications like the LM386 guitar amp I may be able to further expand the versatility of the instrument. 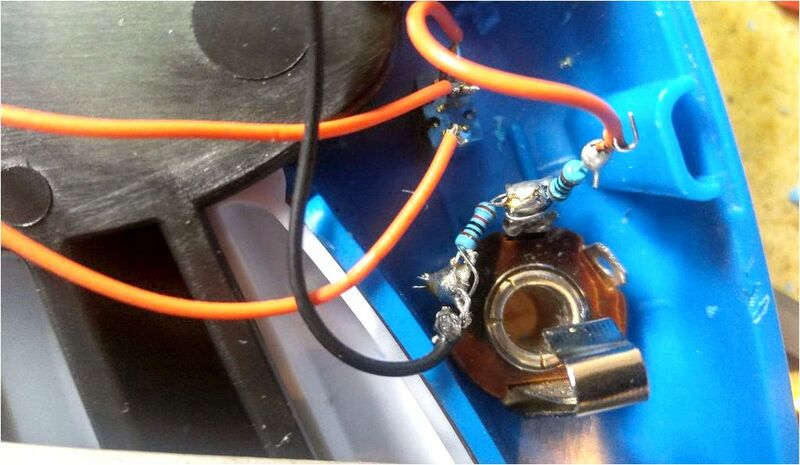 The first modification deals with the gain of the amplifier. If you’ve worked with LM386s in the past you may already know that the gain of the amplifier is set using pins 1 and 8 of the chip. Essentially by placing a resistor (usually 1 ohm – 10K ohm) and a capacitor (typically 10 uf) between these two pins you can set the gain. The higher the resistance of the resistor, the lower the gain. Upon inspection of the circuit I could see this is exactly how this 386D chip was set up. Pin 1 is connected through a 10 uf capacitor, which connects to a 1.1K ohm resistor (immediately to the left of the chip) And then to pin 8 of the chip. In order to replace this system with a variable gain control I removed the 1.1K resistor and replaced it with a 5K ohm potentiometer. By reducing the resistance you can get a slightly crunchier and more distorted sound, and by raising the resistance you can get a cleaner more polished sound. Note the gain level will influence the volume of the output so you will need to compensate for this either at the volume control added in Part 1 or at your mixer/amplifier. While I was under the circuit board attaching the leads for the gain pot I also connected a few more wires for use with my second mod. I connected the first wire (yellow) to pin 1 (gain control pin) and two blue wires to pin 5 (output). These will be used for the second modification I had in mind. This is a slightly less used LM386 circuit modification but still one which is fairly well documented. 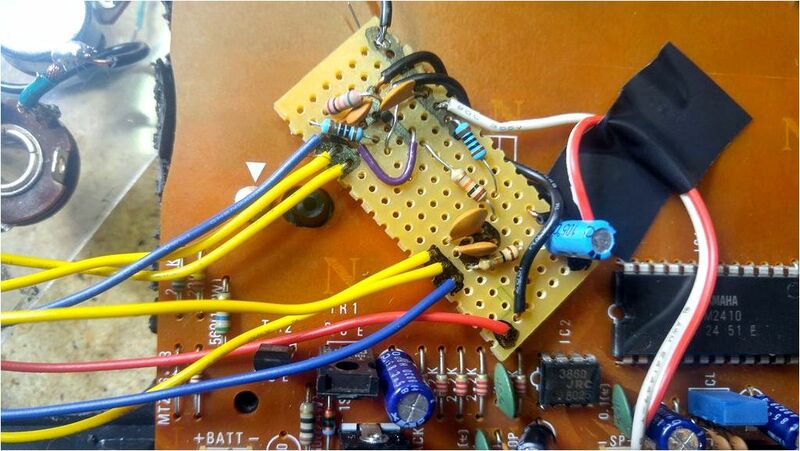 By sending a signal from the output pin (5) through a small capacitor and resistor to the gain control pin (1) you can create a bass boost effect. To accomplish this I attached the first blue wire to a switch on my panel. I then ran it through a 0.1 uf capacitor and a 10K ohm resistor. I attached the yellow wire to the other side of the resistor completing the circuit. Now by flipping the switch you connect the bass boost circuit. Though the bass boost is audible I am not overwhelmingly impressed with it. It is far from the thumping low end I was hoping for. This may be a limitation of the device itself but I feel like further experimentation is needed. I will be going back in to experiment with some other cap/resistor values and other circuit options to see if I can get a better effect. I will report back here if I find better results. The second blue wire I connected through a resistor to an LED and tucked it behind the circuit board. Because I used a transparent panel this creates a cool back lit effect and since it is powered from the amplifier output it pulses along with whatever is being played on the keyboard. That about raps it up for the PSS-30 for the time being. I really love the small form factor of this device and would love for it to make it’s way into my regular instrument lineup. In spite of this circuit being a bit limited as far as bend points and options, I still had a lot of fun and got to try out some interesting new things on the circuit. I’m going to keep this device in the back of my mind as I work on other projects and hopefully I can return to it down the road with some new ideas to further mangle it’s square wave outputs. That’s all for tonight but thanks for reading and happy soldering! The thrift store gods smiled on me again this past week. 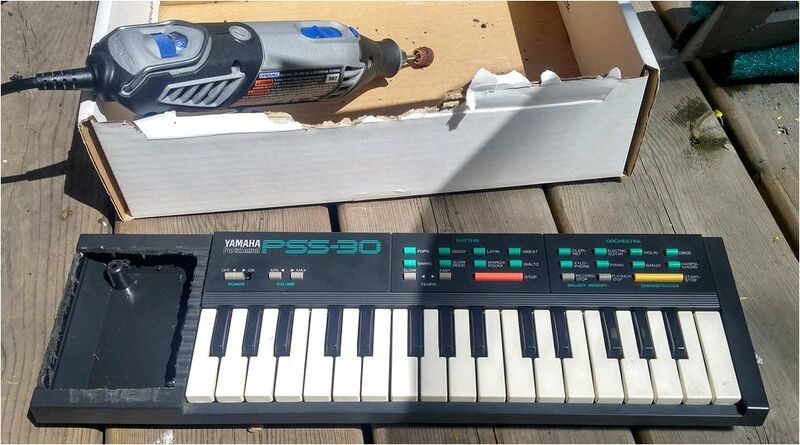 During one of my usual trip to my local charity shop I found a Yamaha PSS-30 marked at 5 dollars. Not only was this tiny keyboard still in the box, it looked like it had barely been played since it’s manufacture back in 1987. I happily scooped it up and brought it home to investigate. Now after looking inside this keyboard and spending some time online I found unfortunately the PSS-30 may not be the holy grail I had hoped it would be. Many of the Yamaha Keyboards of this era (along with many of the infamous Casio SA keyboards) contain two primary chips. The first is a synthesizer chip (usually an FM synthesizer) and second a CPU which monitors the inputs and digitally controls the synthesizer. This allowed some extremely interesting bending by cutting or crossing the data lines to modify the signal reaching the synthesizer chip. Unfortunately the PSS-30 in an effort to cut costs and save space is built to run on only one IC chip. This means the single YM2410 chip monitors the inputs and generates the audio signal internally leaving us unable to access the data flow. That being said I still wanted to have some fun with this very cool vintage keyboard. I wanted to start this project as I do most of my builds, By adding a line out. It was also fairly important to me to add an analog volume pot along the line out. The reason for this was simple, This keyboard uses a basic digital volume control which is extremely loud and distorted on the maximum setting. Unfortunately whenever the device is powered off and back on the digital register for the volume setting resets and it returns to this obnoxiously loud setting. With the addition of an analog volume pot I can set the volume where I want it and leave it there without having to worry about it resetting. To add the line out I cut the speaker lines. I wired the positive speaker line to the top pin of a 100K potentiometer and the ground to the bottom pin. From here I connected the tip tab of a 1/4 inch jack to the middle pin of the pot and the ground from the jack to the bottom pin. This functions as a simple voltage divider and allows you to adjust the amount of the signal which reaches the jack. Since the keyboard itself is so small, In order to create room for the controls I had to remove the speaker altogether. Initially I attempted to drill holes for my components into the slatted plastic speaker cover but things quickly got messy and it became obvious that wasn’t going to work. Instead I used my trusty rotary tool to cut out a rectangle where the speaker had been and covered it with a square of plastic I cut from an old DVD case. This will be my control panel for the time being. Once I have the device working how I’d like it I will likely replace this plastic panel with acrylic or steel to give it a more professional look. Additionally as something of an experiment I built a small two knob tone control circuit into the line out. 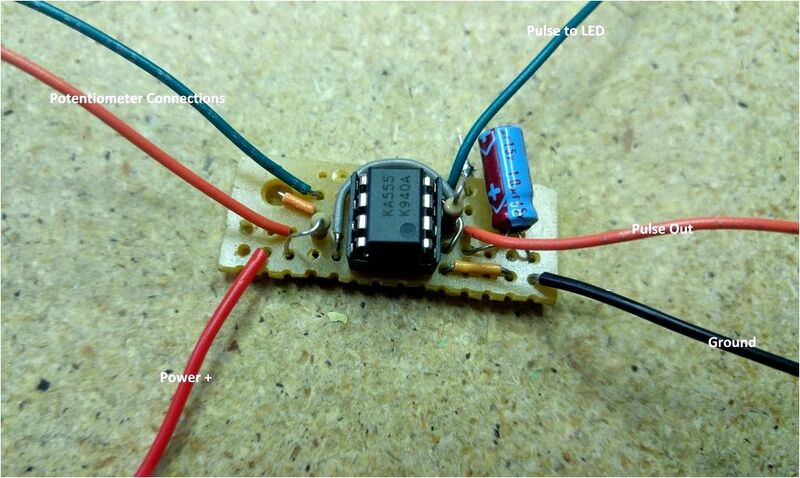 This is a circuit I picked up from an excellent article over at Nuts and Volts (Fig 12). The circuit essentially functions as an adjustable low pass and high pass filter. Since the circuit itself is passive I did experience some attenuation but not enough to become an issue. Since this keyboard uses only square wave audio the capacity of these filters is somewhat limited. You can make some adjustment to the sound but if you limit either end too far the sound will become very flat and tin-y. I also noticed that the PSS-30 uses an LM386 as an amplifier meaning that I can try some common LM386 amplifier mods on the circuit as well. I will be posting again shortly to let you know how they went but in the interim thanks for your time and happy soldering! The latest toy to come across my work bench was a Little Tykes Pop Tunes Keyboard. This toy stood out to me at the thrift store for a few reasons. First and most obvious is the awesome LED ring located between the power knob and speakers. Further it had some weight to it and appeared to be solidly constructed which gave me some hope for what may be found inside. Finally the song samples made it stand out from a lot of other toy keyboards I had played with. 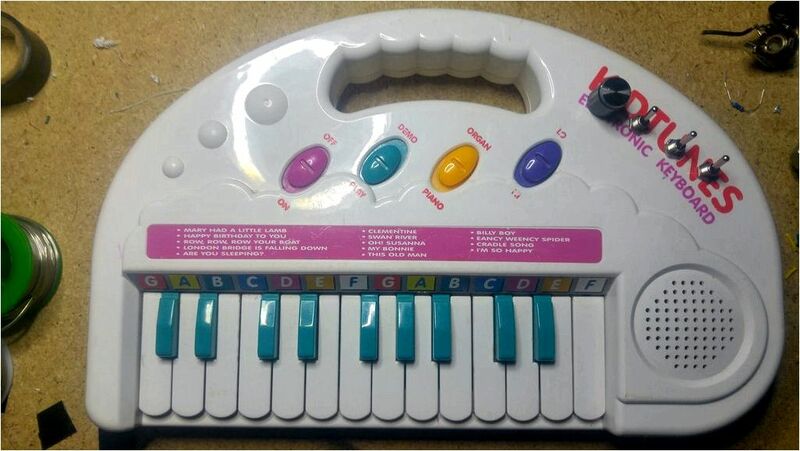 Rather than ear shattering renditions of “Old MacDonald” or “Mary Had a Little Lamb” the pop tunes keyboard featured recognizable (if a bit outdated) popular music (“ABC” by the Jackson 5 for example). Upon opening it up I found a fairly simple SMD circuit board with a black blob IC. There were quite a few transistors and resistors though a large quantity of them seemed to be associated with the LED functionality. Still there was plenty to play with so I set to it. The first step (as with all my toys) was to set up a kill switch and line out for the toy. For the kill switch I simply cut the battery positive wire and placed a switch on it. As far as the line out I cut the speaker positive wire and ran it through a toggle on – on switch. The other side of the on – on switch I ran through a 1K resistor and into the tip of a 1/4 inch jack. I then placed a 10K ohm resistor between the tip and ground and ran a wire from the ground back to the ground point on the speaker. I recommend experimenting with different resistor values to get the volume level you require as it can vary from device to device and also depending on where you are sending the signal. Next up I set up a pitch bend on my Pop Tunes Keyboard. First off a big thank you to alienmeatsack who made a great post about this toy on Electro-Music.com and led me to this bend. This pitch bend is slightly different than the ones I’ve used in the past as it makes use of three points on the board rather than replacing a single resistor. For this bend I used R1 as the pitch base and soldered it to the center pin of a potentiometer. I then connected the outer pins of the potenetiometer to R07 and R011 which shift the pitch up and down respectively. The toy will crash if you shift to far to either side so you may want to buffer the pot with resistors on the outside pins. I found around 4K to 5K worked fairly well for this but there is no substitute for experimentation. I was blown away by the low end bass when the pitch was shifted down on this device. The quality of the rumbling drones you can produce are just incredible for a toy like this. 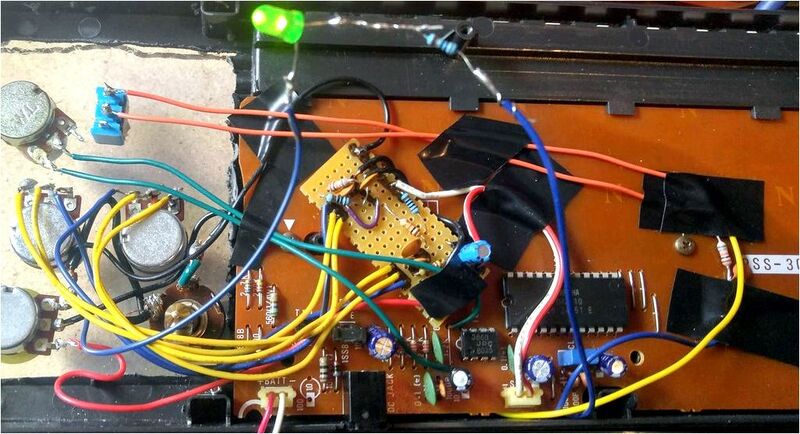 Alienmeatsack also talked about getting good results from a voltage starve on this device so I may try that out. And I’ve found a few glitchy areas on the board which I would like to investigate. I should be back to update you on my progress soon. NOTE : Shortly after writing this post I was experimenting on this board trying to force a loop when one of the resistors cooked itself… There was a little puff of smoke and many tears. I will come back to this toy and see if I can replace the resistor and get it running again but it may be on it’s way to toy heaven. This problem was not caused by the pitch bend which seems to be very stable and produced excellent results but if you are exploring the board be careful as some of the resistors appear to have a very low tolerance. Happy Friday! Wanted to provide you guys with a quick video demo of my Gate Sequencer and Kawasaki I-Soundz drumkit being played together as a circuit bent drum machine. A few weeks ago during one of my usual thrift store exploration I picked up a Kawasaki I-Soundz drum kit. Even before doing any bending I started having a great time with this toy. It has a large and varied vocabulary of samples and surprisingly high quality stereo audio driven by an internal TDA 2822 operational amplifier. I was also pleased to find that rather than the tactile buttons I’ve seen on many toy drum pads the Kawasaki kit is driven by piezo disks similar to higher end drum synthesizers. Unfortunately the device does not offer any polyphony but given the price point I did not expect it. The drum pads also contain a number of interesting on board rhythm samples. Unfortunately these samples only play for about 30 seconds before stopping (regardless of whether you are playing the kit). Since I was looking for something I could use to set up repeating rhythms while I played other devices this left me with a need. I wanted to set up external triggers for the drum sounds. By using these external triggers in conjunction with my recently completed 4017 gate sequencer I could turn the Kawasaki drum pads into an 8 step drum machine and unlock a world of new rhythms. The first step whenever you are setting up external triggers on any toy is to create a ground share point. This can be done by simply adding a banana jack or binding post and connecting it to any ground point on the circuit. If you are using grounded connections from your trigger source (such as 1/4 inch, 3.5 mm or RCA cable) then you can simply connect the ground point to the ground on your trigger input jacks rather than having a separate plug. Because (in it’s normal operation) this toy is triggered by piezo disks most of our work is already done for us. When the pads are hit the piezo disk creates a trigger pulse. This pulse is sent to the base of an internal transistor (highlighted above), which switches the circuit on momentarily and causes it to play the sample associated with the drum pad hit. All we need to do to set up external triggers is send our external signal to the base of these transistors to switch them the same way the triggers from the piezo do. One thing I am admittedly not incredibly comfortable with is soldering onto SMD (surface mount) circuits. That being said this is something that I feel I need to improve and develop my comfort with. Surface mount technology becomes more prolific and through hole circuitry becomes rarer and rarer each day. Further developing my comfort with SMD will open up near endless possibilities of new circuits I can work with. For this reason I have made it a goal not to shy away from these circuits. I will take the necessary care but am determined to become as familiar and comfortable with them as I am with more traditional components. Where possible I soldered my leads to resistors adjacent to the internal transistors as there was less risk of damaging these components. To solder I held my soldering iron to tinned wires to heat them up prior to touching the board. 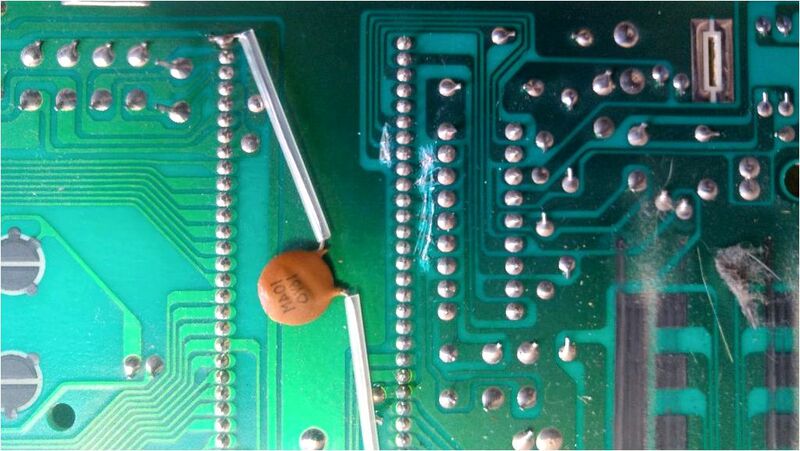 Once the solder on the tinned wire was liquified I lowered the wire and soldering iron to the soldering point together. 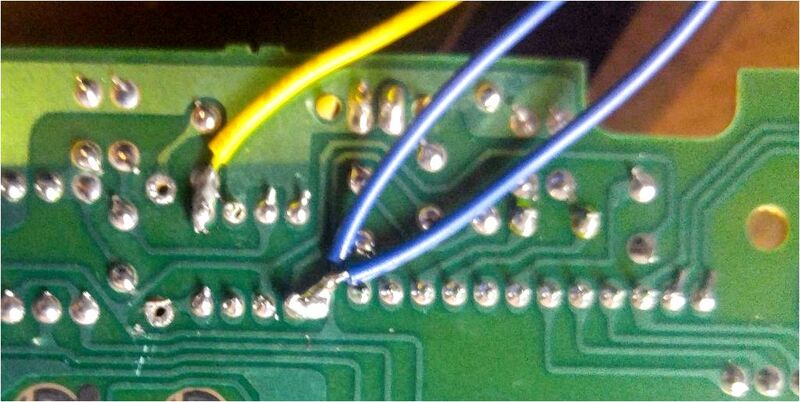 I raised the soldering iron from the board almost immediately after touching the two down and held the wire in place until the solder solidified. The key here is to spend as little time as possible with the soldering iron on the board. The components are significantly smaller and the solder connections are significantly weaker than traditional through hole circuitry. This means any excess heat on the board can damage components or loosen their solder connection knocking them out of place. Since my solder points were weaker and the circuit was so crowded I also added a small amount of hot glue to each connection. This gives each connection added strength and also insulates the wire from the other components to ensure it doesn’t touch any other solder points. For reference the solder points I used for the triggers were on R10, R13, R8, Q3, R2 and R4. Finally connect the wires from the trigger points to the trigger inputs of your choice. I was short on plugs so I have used bolts but you can easily use banana, 1/4 inch, 3.5 mm, RCA or any other type of input you have on hand. Now that I have the external triggers set up on this drum pad I will be going back into the circuit and completing some more traditional circuit bending. I will be adding a pitch bend and hopefully will be able to find some other interesting bends and effects to give me an even wider range of sounds to use. Hey guy’s I just created and uploaded a quick video to show off my progress on the Vtech Alphabet Apple. Unfortunately I was having some issues with my portable amplifier so I ran it through the internal speakers but this should still give a good idea of what the bends I’ve completed so far can do. The demo starts off a bit slow but picks up after 1:20 or so. I also get into a really interesting glitch near the end of the video using the voltage starve. I have to admit for some time I have been stalled with my Vtech Alphabet Apple circuit bending project. I love the toy aesthetically and have always felt like there should be more bends available then what I was able to find. However even after hours of experimenting and dissecting this toy I was left feeling somewhat underwhelmed with the results. Over the weekend though I brought it back out determined to turn it into a more functional instrument, and to do that I needed to create a trigger oscillator. Since I hadn’t had any luck finding a loop on the board I moved on to less straight forward methods. I decided what I needed was a way to send a signal at repeating intervals to one of the contacts on the button matrix to trick the Vtech Apple into thinking a button was being repeatedly pressed and trigger a repeating sound. By generating this signal independently I could manipulate its frequency and control to suit my needs. Once I had a clear definition of what I needed to get the job done the solution seemed all to clear, what I needed was a 555 timer. By setting up an astable 555 timer as a trigger oscillator I could route the square wave signal into the button matrix to repeatedly trigger the button (or buttons) of my choosing. Further by using a potentiometer I would be able to adjust the frequency of the square wave and therefore control the time between button presses as needed. This is a simple mock up of the circuit I used. Note that for this to work the positive voltage must be supplied by the toy itself and the ground must be share with the toy as well. This is easily accomplished by running the power from either the positive power connection on the Apple’s circuit board or directly from the kill switch installed in Part 1 . Just ensure it is connected at or past the kill switch so that the kill switch will remove power from the oscillator as well. Similarly the ground can be connected to any ground point on the circuit. After testing my plan using a breadboard I put together this small 555 timer circuit on a scrap piece of perf board I had laying around from a previous project. I did my best to keep everything as small and compact as possible as my space inside the toy is somewhat limited. I’ve seen some circuit benders using what is called the “Dead Bug Method” in these situations to further minimize the size of the circuit. When building a dead bug circuit the components and connections are soldered directly to the pins on the IC rather than onto a piece of perf board. This can be an excellent way to shrink the circuit for those really tight fits but also leaves you with a more fragile product so since I could get away with using a board in this toy I did in order to get more stability and durability from the circuit. I will revisit dead bug circuits in a future post but in the interim there are many demonstrations of the method on YouTube if you deem it necessary. 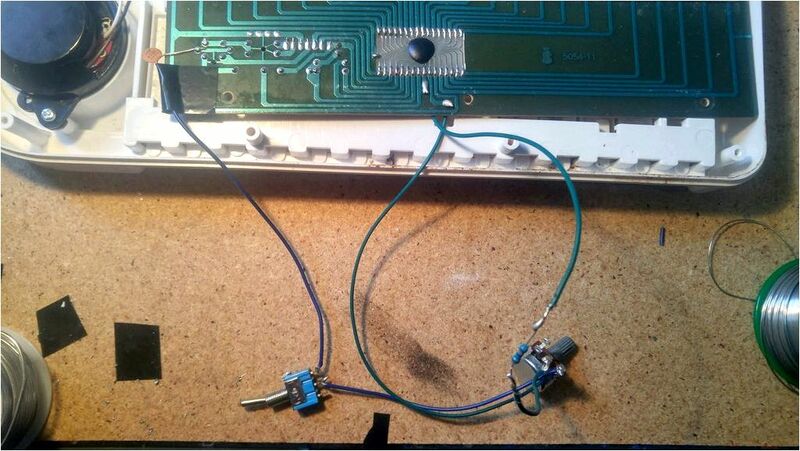 Once I had my 555 trigger oscillator circuit built the next step was to install it in my Vtech. I started out by planning positions and drilling holes for the potentiometer, switch and LED. Once these were in place I began the process of wiring the leads I had left on the 555 trigger oscillator circuit to their respective locations on the toy. On the diagram below I have marked the approximate paths of each wire upon installation. In planning this mod I did my best to limit the number of wires crossing between the back and front sections of the toy as these wires tend to get put under a lot of stress when the toy is being opened and closed. To achieve this I pulled power from my kill switch and sent ground directly to the negative terminal on the battery box. Since the switch and pot are mounted on the back portion this means only the pulse out wires have to cross over to the front half of the apple. You may also notice that there are two pulse out wires leading from the switch to the button matrix. I used a 3 position on-off-on switch for this bend which allowed me to send the pulse to two locations based on the switch position (as well as nowhere in the off position) By connecting the opposing sides of the switch to different positions on the key matrix I am able to choose between two different buttons when running the oscillator. If you were so inclined and had the space to work with you could take this even further using a rotary switch or patch bay to allow you to select where the pulse was being sent. If there is a specific key you are after which you are not finding by touching the pulse to the solder points on the matrix try using your probe to connect sets of two points on the matrix together. If you find that this is necessary to get the input you desire this can be done by bridging the two points with a transistor and feeding the pulse into the base (more on that in a future article). Once everything was wired I secured the 555 circuit and LED with hot glue, taped down all the loose wires and closed up the toy. I have to say after playing with it a bit I am really enjoying this modification. I’ve been able to produce a host of strange noises and effects and without having to use a hand to continually press the buttons I feel like I’m finally able to take full advantage of the other bends on this device. I’ve been having particular fun using the power starve to produce glitches in conjunction with the continuous oscillating noise produced by raising the rate of the 555 to high frequencies. That’s all for today but I hope you guys have fun. Happy soldering! Circuit Bent Kid Tunes Electronic Keyboard.